Those who are looking for a fun and easy yoga class may be in luck. Casi Summers, part-time yoga instructor at OCCC, hosts a class called “flow yoga,” each Tuesday and Thursday, 2:00 – 2:45 p.m. in room 1C4. Summers said she has been practicing yoga for five years, teaches yoga full-time outside of the college, and has taught classes at the college since last August. When asked about the difference between traditional yoga and flow yoga, Summers said, “Yoga has so many different branches. We’re basically moving from one pose to the next. 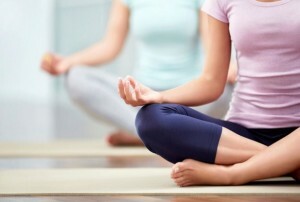 Summers said yoga is just one of many activities that a person can do to stay healthy. She encourages a healthy lifestyle that starts with moving. Summers said her favorite part of yoga is the diversity. Summers described the class as easy to teach and participate in. Summers said the class is not hard for people to get into. Typically, she said, the class has a small number of participants, but the experience is intimate. She said in some of her other classes with 20-plus students, she doesn’t get to know them that well. This class is free for all OCCC students with a valid OCCC ID, as are all group fitness classes at the college. Classes are available on a first-come, first-serve basis. Present your student ID at the Wellness Center desk for a wristband. For more information, contact Summers at 503yoga@gmail.com, visit the Recreation and Fitness office on the first floor of the Main Building, or call the office at 405-682-7860.